Fist make a poori like dough with the maida, salt and oil/ghee with very little water. Pinch off small balls of dough just like we do for making pooris and roll out thin discs of poori. Fold each disc in half or into quarters and deep fry till crisp and cooked. Meanwhile keep the milk to boil with sugar, saffron strands, cardamom powder and let it boil till slightly thick . Let it remain on a low flame.Fry the prepared poli discs and dip into the hot milk. When a sufficient no of polis have been immersed in the hot flavored ilk. Keep aside and serve on a tray with milk and chopped nuts for garnish. 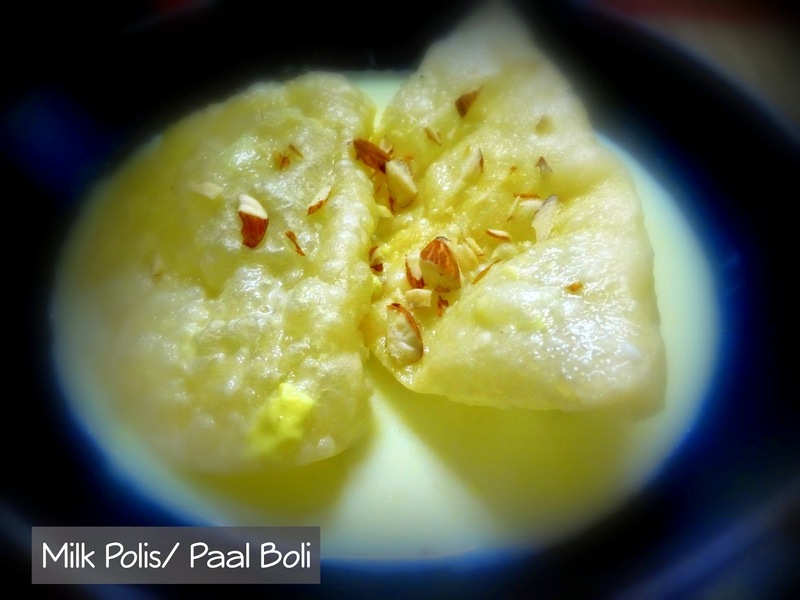 At this time you can add the condensed milk on top of polis before serving to get a rich taste . It is better to fry the poolis and store separately when cooled in an airtight box and keep the milk warm to serve the polis . Assemble few minutes before serving to make it less soggy. Prepare the poori discs in advance in a big batch, comes handy when kids demand a snack, it is very enjoyable too as it s simple to prepare.